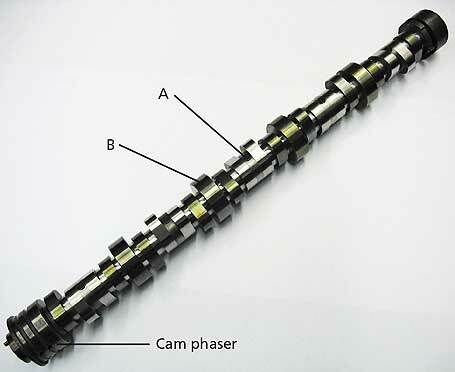 Although it looks like one camshaft with a phaser at the left end, it's really a hollow tube-type shaft with a second, solid shaft through it, with the phaser connected to both. The intake cam lobe assembly (A) has a pin that goes through a slot in the hollow camshaft and is pressed into the solid cam. The exhaust cam lobe assembly (B) is pressed into position on the hollow camshaft. The 2007 Dodge Viper SRT-10 is attracting headlines for its new V10 engine, which is rated at 600 hp (450 kW) at 6100 rpm, a huge increase from the previous 510 hp (380 kW) at 5600 rpm. Yes, the engine now has twin throttle bodies, a new deep-breathing intake system with larger intake valves, and more aggressive cam lobe profiles. More significant, however, is that it is also the first production pushrod-valve engine with truly variable valve timing (VVT) -- on the exhaust valves. Using a phaser on a camshaft-within-a-camshaft design (Mahle's CamInCam), the V10 can change exhaust valve timing up to 45* vs intake valve timing, although only 36* actually are used. This compares with General Motors' simpler VCT (variable cam timing) on 3.5- and 3.9-L V6 engines, in which a phaser on a single solid shaft changes timing equally on both intake and exhaust lobes. The Viper design, developed with Mechadyne International, provides the advantage of VVT while retaining the compact size of a pushrod-type, cam-in-block engine. Chrysler Group did look at a dual overhead-cam arrangement to advance the Viper V10 performance, but it simply would not fit. Exhaust-valve control was chosen over intake to provide the valve timing variability needed to improve the idle and part-throttle combustion stability, normally an issue with engines whose camshafts are tailored for high-end power. The performance camshafts produce high exhaust-gas dilution of the intake charge at low rpm/light loads. This results in unstable combustion, which can affect idle quality, emissions, and the ability of the engine computer to detect misfire, which is a federal emissions requirement. Intake valve control was not chosen because its prime benefit would be improved low-end torque, something the 8.4-L V10 has plenty of, although the 560-lb/ft (760-N/m) peak is at 5000 rpm. Intake control would simply "translate to more tire smoke on a Viper," explained Chrysler SRT engineer Kraig Courtney. Although technology exists for both intake and exhaust VVT with the pushrod cam-in-block, it would require new designs both for the camshaft and phaser, deemed an unnecessary complexity and cost at this time. The exhaust-only VVT design enables use of a modified Mahle hollow camshaft and a reworked off-the-shelf cam phaser by INA. The intake valve cam lobe assemblies are slid onto the hollow exhaust camshaft and positioned above the slots, in a build sequence that permits exhaust lobes to be pressed into position on the hollow shaft. Locking pins are driven through the intake cam lobe assemblies. They pass through the slots in the hollow shaft and are pressed into the pin holes in the solid shaft, locking the intake lobes to the solid shaft. When the solid shaft is turned, the phaser can move the hollow exhaust camshaft between advance and retard positions vs. the solid camshaft, within the range allowed by the slots and the solid pins that go through them. The 500-rpm increase for peak power was enabled by a number of changes that reduce valvetrain weight, including new valvetrain geometry. Although the intake valves are larger in diameter for improved breathing, the stems are hollow and shorter. The exhaust valve stems also are shorter. Although the Viper engine displacement was increased from 8.3 to 8.4 L and the bore was increased from 102.3 to 103 mm (4.03 to 4.06 in), the objective was not the tiny increase in swept volume. The higher engine performance called for stronger reciprocating parts, particularly the connecting rod. With just the small bore change, the SRT V10 could take the already-available rod and piston assembly (with a floating wrist pin) from the 6.1-L SRT Hemi V8. The V10 cooling system was upgraded with reshaped chambers for better flow, and two new two-speed electric fans that provide more airflow replaced the hydraulic fan. Although the Viper SRT V10 VVT valvetrain now is the technology leader for cam-in-block engines, it's known that GM has a small-block V8 in development with variable intake- and exhaust-valve timing in a three-valve configuration. We may not see a four-valve pushrod gasoline engine, despite use of that valvetrain in diesel V8s. However, cam-in-block pushrod gasoline engines have a high-tech, high-performance future, and both Chrysler Group and GM keep engineering teams on the job of developing it.